Olive oil biscuits with carob preserve all the characteristics of the classic olive oil biscuits. 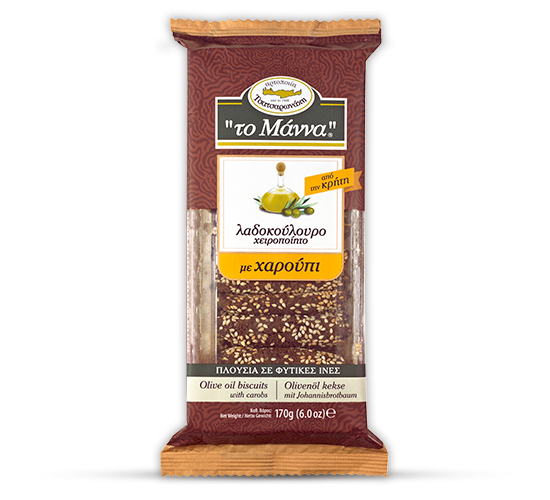 In addition, they contain carob flour and carob beans produced in Crete. The use of these two ingredients, in combination with all of the above ingredients, adds to increased nutritional value beyond comparison when compared to a conventional biscuit. Carob is a rich source of calcium, iron, magnesium as well as many antioxidant substances. A healthier way to enjoy biscuits!